based on information from a variety of sources including Reuters, Ad Week,Wikipedia, The Guardian, BBC Guardian, Business Weekly, the Dumb Ways to Die Campaign website. Young people tend to ignore Public Safety Announcements (PSAs) warning them against the dangers of.......everything. Not only are they gloomy and depressing, but they're also boring! So.....what's an ad agency to do when it wants to make them sit up and pay attention to a safety message? Make it irresistibly fun, catchy and incredibly easy to share with friends on social media ... .just like everything else they get a kick out of. The three minute TV and online commercial ( or PSA) is part of a much larger campaign that includes billboards, radio spots, karaoke jingles played in train stations and a website in which people can promise to be safe. 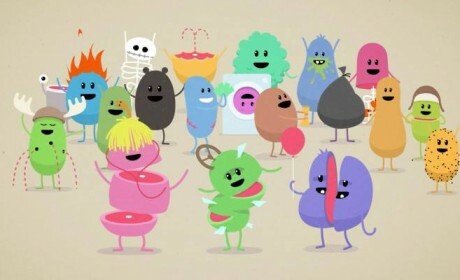 The PSA itself a shows an animated video of cute little kidney shaped creatures doing the stupidest things you can imagine - sticking forks in toasters, keeping a rattlesnake as a pet, setting fire to your hair, and selling both your kidneys on the Internet among others. All of the stupid actions end up in horrible and completely senseless fatal accidents. 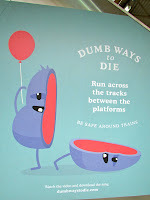 The ad then goes on to push the idea that the the dumbest and most pointless way to die is to be careless around trains. Within days of its release, the ad became a viral Internet hit racking up more than 20 million views. Today, more than 55 million viewers have seen it. The campaign, by advertising agency McCann Melbourne, swept the awards at this year's Cannes Lions International Festival of Creativity, winning a record five Grand Prix awards, 18 Gold Lions, three Silver Lions and two Bronze Lions, the most ever awarded to one campaign in the festival's 59-year history. It is the second year in a row that the top film award has gone to a campaign with a social message . US fast food chain Chipotle won last year with a similarly with a similarly-styled animation-with-music ad about sustainable farming and production. Accidents and deaths among young people on Melbourne's trains have been increasing for years, but advertisers needed to find a way to promote a message about safety in a way that would reach its intended viewers. "The idea for a song started from a very simple premise: What if we disguised a worthy safety message inside something that didn't feel at all like a safety message, " said John Mescall, executive creative director of McCann ad agency. "So we thought about what the complete opposite of a serious safety message should be and came to the conclusion that it should be an insanely happy and cute song." The song, composed by members of Australian bands the Cat Empire and Tinpan Orange, has hit music charts in 28 countries, inspired three parody videos ( see video at the bottom of the article) that have each been watched over a million times, was recently turned into an iPhone game that is now the seventh most popular free app in Apple’s (AAPL) app store, and is being turned into a children’s book. It has also been very successful in its original goal, preventing accidents on commuter rails in Melbourne. In the three months after the campaign was launched, the system experienced a 21 percent reduction in accidents and deaths compared to the same period last year. The goal was 10 percent. 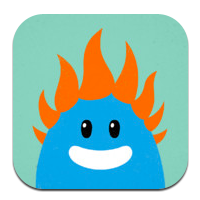 According to an article in Business Week ,“Dumb Ways to Die” has been success for some obvious reasons. It’s catchy and it's funny. But it has another, less obvious, thing going for it: the power of positivity. Two researchers from the University of Pennsylvania studied the New York Times most-e-mailed list (PDF) for signs of what kind of emotions were associated with people sharing information through email and other social media . What they found was that people like content with positive messages - even when the message is a serious one. 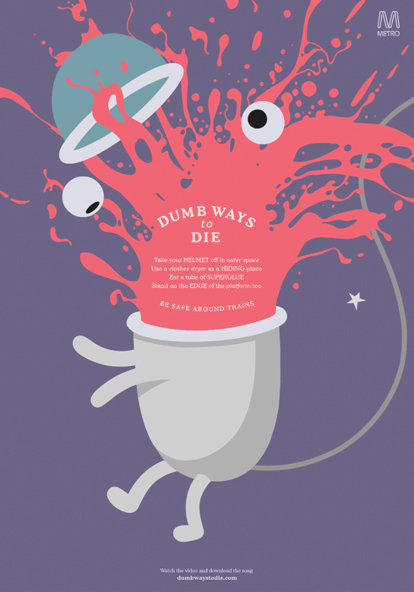 The Dumb Ways To Die campaign had both, and therefore appealed to the widest audience - both adults, teenagers, children and even educators. Watch the following video on the story behind the campaign and answer the comprehension questions. 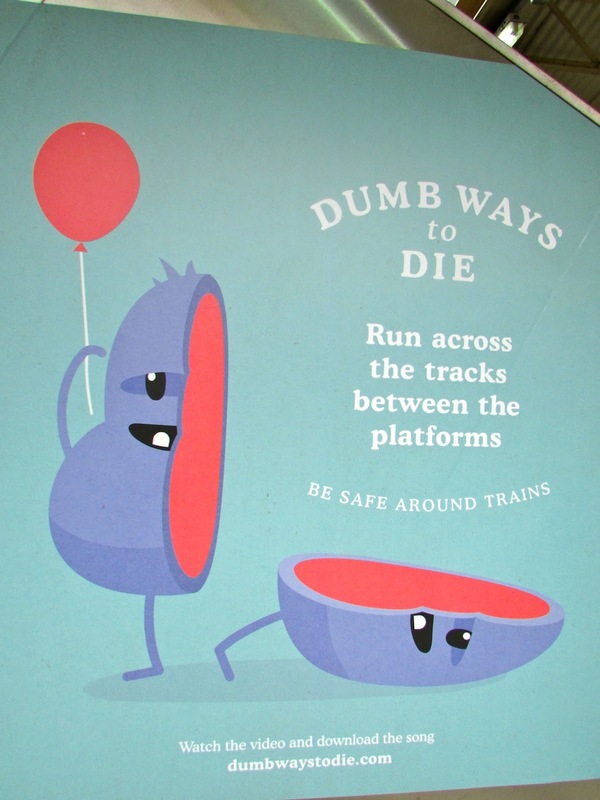 The Dumb Ways to Die PSA and train safety campaign has inspired many video parodies - with even more suggestions and idea. Work on brainstorming, vocabulary and grammar . Before you watch any of the following videos, see if you can come up with your own lists of ideas for each of the titles. Then compare your ideas with the ones suggested in each video. How did you do? Here is one more parody, but with a message about living rather than dying. Before you watch, try to come up with as many "smart ways to live" as you can. Then, compare your list with the ones in the video. Did you enjoy this post and the activities? Please leave a comment below to let me know how I'm doing. Share the post and its activities with others through email or any other social media. I'm so glad you liked it. I hope your class has fun with it. I found that my teenage students as well as those in their twenties had a great time listening, singing and making up some ridiculous songs of their own. Unfortunately they were too shy to post them. Maybe next time.